My name is Eugén Sedkó. I live in Kiev, Ukraine, play guitar in flamenco style, compose and perform my own music. I take part in flamenco and fusion concerts, I am also a guitar teacher. 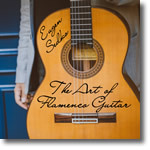 On this site you can see my biography, my transcriptions or flamenco guitar video lessons. Besides guitar I am interested in many other ethnic styles of music: lautary (violin and Ukrainian sopilka), hindustani classical rhythms (Indian tabla), celtic and fusion music (mandolin), oriental music (different pipes). Guitarist and leader of Flamenco Fusion Band from Kiev. I am also a guitar teacher in Kyiv. This site is my personal space where I put information about my projects, music, videos, etc., in short, all that I consider more or less interesting for people who love music. I hope that here you can find things you are interested in as a music lover. For me music is not just a set of sounds. It's a reflection of the person's worldview via laws of world's harmony. That harmony rules not only the music, but the whole world itself. Music gives me a lot of ideas for composing. I’m not sure if I can carry my ideas and feelings to the listener the way I mean, but I will always keep trying and search for the new ways of doing it.